Hamsters are surprisingly good escape artists. Sometimes you lose sight of your hamster while you are playing with them outside of their cage and they may even escape from their cages and get lost. They can fit into tiny spaces and can disappear quickly and finding them can be tricky. If you are lucky, just leaving their cage door open might be enough to entice a lost hamster back home. In the meantime, follow these tips to help you find a lost hamster. The first thing to do is to look in some of your hamster's favorite hiding spots. Do a thorough search as soon as possible after you've discovered you've lost your hamster. Keep in mind that your lost hamster is probably scared and will look for a secure hiding spot. Start your search for your hamster near their cage and move away from there. Check behind and under furniture, as well as down the sides and backs of sofas, under cushions, etc. Look inside cabinets, drawers, shelves, and bookcases. Don't forget to look inside, behind, and under items stored in these places. Check the underside of furniture and beds for any holes through which a hamster could climb inside. Check inside any boxes you have around the house including tissue boxes. Look inside any backpacks, purses, other bags, and shoes. Check the undersides and backs of appliances for holes that your lost hamster could have climbed into. Check behind/under the water heater (or anywhere else where it might be warm and dark). Look for holes or spaces under cupboards or openings that could lead into the walls. Make a note of these for later if you don't find your hamster right away. Unfortunately, it is very difficult to track a lost hamster but there are some tips if you need to try. Remember that hamsters are nocturnal so they will probably only move about at night. Place a small, pre-counted pile of sunflower seeds on the floor in each room. If any seeds disappear from a room that will give you a better general idea where your lost hamster is hiding (unless you have any wild mice that are stealing your bait). Sprinkle a little flour or cornstarch on the floor around the piles of seeds. A trail of little white footprints may lead to a hamster's hiding place. Similarly, sprinkle some flour across doorways and in front of any suspected hiding spots (like spaces under the cupboards or holes in the wall, as noted on your search). Check for footprints to see where your hamster is traveling at night. In the evening, try placing tinfoil or crinkly cellophane on the floor (concentrate on possible hideouts, doorways, and around the cage or food), turn out all the lights and sit quietly. If your lost hamster comes out, you may be able to locate it by the noise made as it walks across the foil or cellophane. Tie long strands of yarn to some peanuts in the shell. Your hamster may gather them and take them to it's hiding place, in which case the strands of yarn will lead you to the hiding spot. Sometimes hamsters are not that easy to catch, even if you locate them, so you might have to set a "trap" to safely catch your lost hamster. Some hamsters will come back to their cages on their own. Leave the cage open on the floor (with a supply of fresh food), near its usual location. 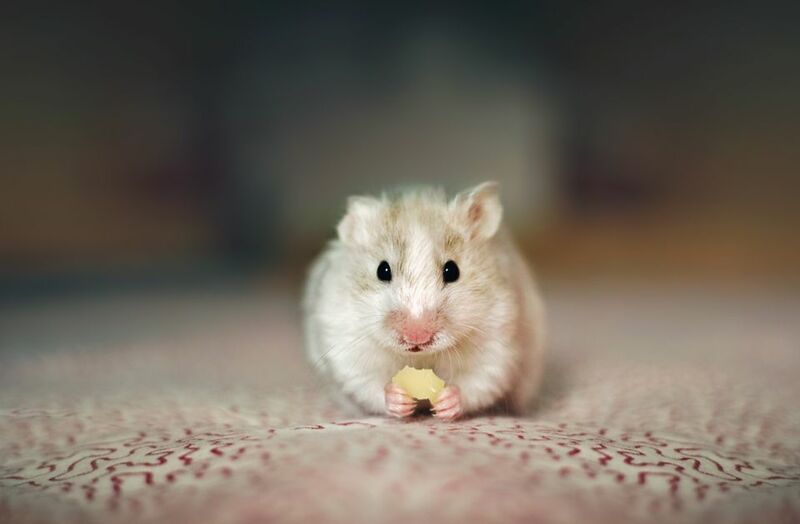 You may have to stay up late to close the door on your hamster when it returns, though they are often happy to be home and settle in for a nap after eating. Set up a "bucket trap" by getting a bucket and place a thick towel on the bottom. On top of the towel place some really tasty treats such as a thin layer of peanut butter on a cracker, apple slices, and/or cheese (something the hamster will easily smell). Make some sort of ramp up the outside of the bucket using wood, a wire shelf, or books stacked to make a staircase. The idea is that the hamster will go up the ramp in search of the food and jump into the bucket to get it but will be unable to climb back out. The trick is to make the treat so irresistible that the hamster will be willing to jump into the bucket for it. As a last resort, get a humane mouse trap, also called a live mouse trap and bait it with peanut butter. These do occasionally malfunction so it is possible that it could injure your hamster but it is fairly unlikely and they usually work well. Remember to be patient and do not give up too quickly. Hamsters seem to manage on their own quite well for a few days feeding off of crumbs or stored food in their cheek pouches. Many people are often sure that their hamsters are gone for good and suddenly a few days later they find them.